Mike Heinrich and several other instructors will be here to teach and lead line dances on Sunday, May 19 from noon to 5pm. All levels welcome from beginner to advanced. You are welcome EVERY Saturday night from 7 - 10 p.m. to dance (see below for our list of bands). Swing and sway to Waltz, Fox Trot, Swing, Latin, Polka, and Schottische rhythms, country, rock...well, you get the idea — we have a variety of bands and lots of music! A great place for people taking dance lessons to come and practice in a warm and friendly atmosphere where there are many different levels of dance skills - just come and have fun! This is a wonderful opportunity to meet people and make new friends in a smoke and alcohol free adult environment. A potluck break is at 8:30 p.m. Cost is only $5 per person for your dancing and listening pleasure. 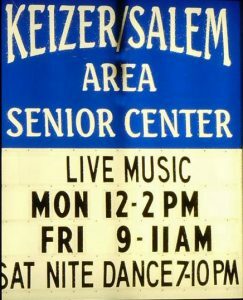 Every Friday morning (9am to 11am) we have live dance music provided by the all-volunteer Keizer/Salem Area Seniors Dance Band. Join us for some fun social time. Each month we will have a THEME DANCE. Dress for the theme, and join us for lots of fun. Stay after the dance for one of the best lunches in Keizer or Salem! See the calendar for this month's theme and date. Every Monday afternoon (noon to 2pm) we have live dance music provided by the all-volunteer Keizer/Salem Area Seniors Dance Band. Start out your week with some FUN! K/SAS offers Line Dance (beginning, intermediate and advanced), Ballroom Dance and Social Dance Classes . Check the calendar for current schedules. Questions?? Call (503) 390-7441 and ask about our current offerings.